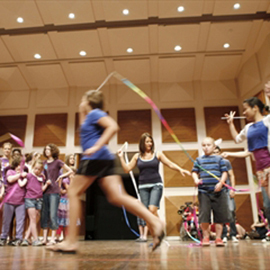 Waterloo – Wilfrid Laurier University’s Arts Express summer camp for children with special needs, their friends and siblings will stage the program’s final dance, drama and musical performance July 14 at 1:30 p.m. in the Maureen Forrester Recital Hall on Laurier’s Waterloo campus. Members of the public are invited to attend. Arts Express is an inclusive week-long creative arts day camp held each year where children ages six to 14 experience art, music, drama and dance in a fun and accepting environment. The campers’ week is themed around experiencing travel throughout the beautiful Canadian countryside. The camp is led by students from Laurier, the University of Waterloo and the University of Guelph who are enrolled in the Community Service-Learning course, "Inclusive Arts for Children," offered by Laurier’s Faculty of Music. Students in this course experience the arts while reviewing theory and practice from creative arts therapies and learning strategies for working with individuals with special needs. During the Arts Express camp, students work as camp leaders applying theoretical concepts learned during the course through the dynamic and rich placement experience at camp. “Arts Express allows children to experience the creative process and not worry about perfecting an artistic product,” said camp coordinator Elizabeth Mitchell, Laurier’s music therapist-in-residence. “As campers engage in art, dance, drama and music, they explore their creativity and discover new ways to express themselves and communicate, which has special relevance for children with diverse needs and ability.” Arts Express is co-sponsored by KidsAbility and Laurier’s Faculty of Music, as well as the Carousel Dance Centre, the Early Childhood Education program at Conestoga College and the University of Waterloo. For information about registering for Arts Express in 2018, email artsexpress@wlu.ca.